Early postwar era, when R&D spending first surged, saw advances such as the invention of the microchip and the launch of the Apollo program. In a global economy and high-speed product development, is the U.S. government and private sector investing enough in innovation? Twitter is among the best-known social media companies, but lesser known is its investment in research and development (R&D). According to data compiled by Bloomberg Businessweek, the company spends a whopping 46 percent on R&D relative to total revenue. But where exactly is this money going? While analysts are hopeful that sky-high company R&D budgets will help reinvigorate American productivity, private-sector R&D has historically been focused on developing a company's own technology—not finding fun­damental technological breakthroughs that span different industries. Indeed, the only way to ramp up productivity may be for today's leaders to invest in basic research linked to large-scale national goals like G.I. builders once did. 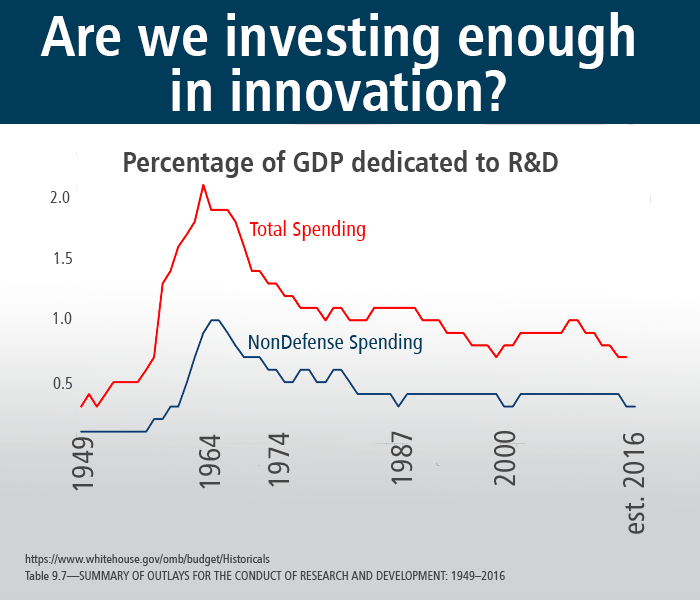 R&D spending is fundamental to overall economic growth. According to the National Science Board, research and business surveys show that R&D leads to improved prod­ucts and services, higher productivity, and lower prices. In fact, R&D is the only way we know of to encourage "innovation," a major but ill-understood contributor to productivity growth. Economists such as the Federal Reserve Bank of San Francisco's John Fernald and Bing Wang loosely define innovation as the part of productivity that cannot be ex­plained by changes in worker skill or capital investment. It's because of America's recent poor economic performance that many are hailing a rise in company R&D spending as a way to spur growth. Though it's tough to pinpoint the cause of innovation, there does seem to be a correlation between R&D spending and the timing of big breakthroughs: The early postwar era, when R&D spending first surged, saw advances such as the invention of the microchip and the launch of the Apollo program. Similarly, when R&D investments soared in the '80s and '90s, we saw revolutions in per­sonal technology and breakthroughs in Big Pharma. Today, though total R&D spending may not be as robust as in decades past, private-sector R&D is accelerating: From 2007 to 2014, U.S. companies funded R&D at a rate equivalent to 1.6 percent of GDP—and from November 2014 through the end of March 2015, this figure rose to an annu­al­ized rate of 1.8 percent, the highest share ever for the private sector. Optimists are saying that this spending has triggered a productivity re­vival. Durable goods orders, an indica­tor of future investment in product­ivity, rose slightly for the second straight month in April—leading some analysts to claim that the economy is coming out of its cycle of "secular stag­nation" (a per­iod marked by low in­creases in econ­om­ic growth, wages, and product­ivity). Accord­­­ing to Neil Dutta, senior U.S. economist at Renaissance Macro Re­search: "If secular stagnation is a 'thing,' then U.S. companies are invest­ing like crazy to make sure it doesn't happen." But there is reason to be skeptical. As R&D spending has shifted from gov­ern­ment to the private sector, the main type of R&D has likewise shifted. Not all R&D is created equal: Of the three main types of R&D, the most transformative is basic research, which is geared toward expanding our basic understanding of the laws of nature and has potential appli­cations across all sectors—for example, a government study of jaw clenching that could shed light on how humans re­act to being confined to small spaces. Applied research, by contrast, assesses that know­ledge as it pertains to different fields—such as the case of Envia, a tech startup that studied high-capacity energy storage with the intent of cutting battery prices. And develop­ment is when these discoveries come to life in the form of new products—like when 510 Systems used its GPS knowledge to build a camera for a Google driverless car. Most basic research, the type responsible for building fundamental knowledge, is funded by the federal government. Even though the government is spending comparatively little on R&D today (just 0.8 percent of GDP in 2014, down from 2.1 percent of GDP in 1964), it con­tinues to provide the lion's share of ground-level R&D spending: According to the National Science Board, 53 percent of all U.S. basic research dollars come from federal R&D invest­ment, compared to the mere 22 percent that come from private-sector R&D. Driven by a growing focus on shareholder value, companies have shifted their focus from basic research to development. In 2003, S&P 500 company spending on dividends and stock buybacks—measures that provide tangible rewards to shareholders—was a median 18 percent, but this figure had doubled to 36 percent by 2013. Private-sector companies have similarly used R&D as a way to maximize shareholder returns: In 2009, nearly 80 percent of private-sector R&D went toward development. Critics have noted that the top R&D spenders are largely focused on bringing products to market instead of basic research. Contributing to companies' focus on shareholder value has been the rise of activist investors, who have taken over boardrooms and demanded changes that benefit the shareholder. In the 1980s, a new brand of high-influence investors emerged: "Corporate raiders" like Carl Icahn took massive equity stakes in undervalued companies, and then pressured these companies to take on debt in exchange for policies that would yield short-term returns. In recent years, these investors, often backed by large hedge funds, have gained a strong corporate foothold: Half of all S&P 500 companies have had an activist fund on the shareholder register sometime in the past five years. How, then, will the United States get out of its economic rut? For this to occur, today's public officials and company heads must prioritize meaningful R&D spending. When G.I.s led government, they oversaw the greatest federal R&D investment in U.S. history. From the post-WWII era into the 1980s, most of America's top-shelf projects were financed by the government. These expenditures were always tied to large-scale goals that transcended single industries: putting a man on the moon, improving America's infra­structure, and defending the country against its adversaries. Today though, absent most of these lofty goals, any revolution in the way R&D is allocated will require a larger investment by the federal government and a private-sector emphasis on game-changing, visionary breakthroughs. Though President Obama's pro­posed 2016 budget includes a 6.4 percent year-over-year increase in R&D spending—a figure far above GDP growth—Congress will likely deem this boost excessive. Until there is a shift in the way R&D is perceived, heightened spending alone cannot be counted upon to heal the economy. Private-sector R&D spending has picked up, spark­ing hopes that this activity will help invigorate the econ­o­my. A closer look reveals, however, that today's private-sector R&D spending isn't of the variety that truly boosts innovation ("basic research"). Instead, private companies are spending most of their R&D doll­ars on development—spurred, in part, by vocal acti­vist investors who are focused on short-term returns. This has left funding for basic research largely in the hands of the federal government. Until the private and public sectors join forces to fund the kind of visionary R&D spending that has fallen by the wayside, it's unlikely that heightened spending alone will provide an economic boost. In the face of budget cuts, experts will espouse the benefits of basic R&D. Arguably the most important part of R&D is the human capital aspect: Basic research, the broadest stage of knowledge-gathering, is important not just for the results it yields, but for the training it gives to researchers—training that they can take with them to any sector. But when it comes time to approve the federal budget, R&D continues to slip through the cracks: Despite President Obama's yearly calls to increase investment in basic research, the federal R&D outlay has continued to fall to where it stands today—a mere 0.7 percent of GDP in 2015. U.S. R&D policy still has a long way to go. In terms of federally mandated R&D incent­ives, the United States ranks far behind many countries. According to Ernst & Young, the United States boasts only 3 out of a possible 17 R&D incentives. (For reference, Belgium and India each offer 10.) The United States lacks such basic tenets as cash grants and tax exemptions for businesses that nearly each of the 34 studied countries offer. However, there are signs of progress: In May, the House voted to make the R&D Tax Credit permanent, which would officially subsidize R&D (although the White House could veto the bill). The transition toward private-sector R&D has not affected all sectors equally. The public-to-private shift in R&D investment dollars has left government agencies far behind the tech curve. Once upon a time, enormous government agencies like DARPA were the major instru­ments of technological change, pioneering every­thing from space travel to the Internet. However, as Foreign Affairs points out, the government has shifted from a net exporter of technology to a net importer. In the 1990s, R&D dollars started shifting away from the mili­tary rapidly, putting private-sector com­panies—from traditional defense companies like Lock­heed Martin to civilian tech giants like Google—in charge of developing military technology. 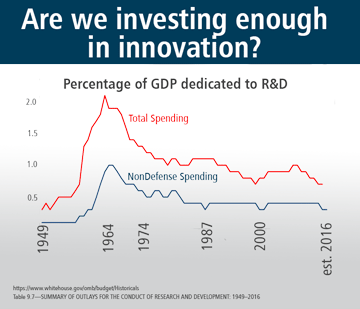 Are We Spending Enough on R&D? While there is hope for the future, how far behind will our lack of investment in innovative-driven R&D put the U.S. economy? U.S. R&D policy still has a long way to go. The transition toward private-sector R&D has not affected all sectors equally.